Finally the last leaves on my Chinese Tallow tree have fallen. There was quite an impressive pile, so impressive in fact that I had to demonstrate much self control once raked into a mighty pile not to dive in :) I think I've mentioned before the importance of having deciduous trees in the garden here in Perth.. sometimes it can be the only way to recognize that it actually IS winter! Couldn't resist having a play with the shot.. don't you think the effect below would be a super design for wallpaper, china, quilt cover etc :) TGIF take care and stay safe.. P.s. both images look so much better embiggened..
More often than not life can be overly complicated so when you do come across something that is straightforward, what you see is what you get.. well, you'd be mad not to take a quick shot or two right! The inspiration for children's store Max & Hound on Beaufort Street in Mount Lawley is one that all grandparents will understand. After looking at their facebook page I can't believe I took the pics and didn't go in, will have to rectify that asap! Painted by Simon Sieradzki this mural couldn't be more perfectly positioned.. the shop next door made me lol though :) Happy Tuesday, take care and stay safe..
Sous le ciel de Paris.. Under Paris skies.. Yesterday we spent un très agréable afternoon listening to la musique française at Alliance Française Fete de la Musique. It was an indoor event making it a leetle bit tricky light-wise although I'm not too unhappy with the shot above. I thought M. Silvio couldn't possibly look more French, but.. he may be Italian :) minor detail, his rendition of 'Sous le ciel de Paris'.. si bon! If you would like to refresh your memory of this tune check out the version here by the super fabulous ZAZ. incroyable! Happy Monday, take care and stay safe.. Shoes on the other feet! Couldn't resist a reflection shot of Farrah Fawcett (1947-2009) at the Rise of Sneaker Culture exhibition. Farrah Fawcett was the 'it' girl of the 70's, who doesn't remember the 'red swimsuit poster'. Asked why he thought the poster was the best selling poster of all time the photographer said "C'mon, who could resist the beautiful, all-American girl looking directly at you with a dazzling smile and a red suit that covered a lot but revealed a little.” Young women in the spotlight these days would do well to take some FF tips, cover up, leave something to the imagination! Gosh that made me sound so old :) Happy Saturday, take care and stay safe.. The Rise of Sneaker Culture encore.. I know a redhead.. not 'sporty' but tres cool :) who would be attracted by the glitter of the Puma X Undefeated Clyde 'Gametime' 24k metallic gold sneakers below.. originally created 'in homage to the US gold medal winning Olympic basketball team'.. The Rise of Sneaker Culture.. then and now. In the city earlier this week we popped in to see what was new at the Art Gallery WA.. there's always something weird and wonderful to see and I suspect that the many school groups coming in below were here to see the Rise of Sneaker Culture exhibition. It has always fascinated me the importance of wearing the right brand of sneakers, it was almost a cult thing at one stage.. is it still I wonder.. surely not! The sneakers above were made in 1915.. I think they're pretty cool, but totally unsuitable for the level of competition these days..
Crown and ‘De Parel Van Vuren’..
... to see Shrek peering over the fence at me but maybe I should have been as he is one of the central characters in Lights by Dreamworks, showing here from 23rd June to 23rd July.. just in time for the school holidays! I don't remember school hols being quite so razzamatazz, but then again my school days were a really long time ago :) Happy Wednesday, take care and stay safe.. Fishing with dad or, caught and bowled! In Burswood Park on Sunday to take photos of something so completely different I couldn't walk by without taking a quickie shot of the sweet father/daughter scene above. A different view of the city looking across from the southern side of the Swan River. If you are a cricket enthusiast the stadium lights seen a bit closer below light up the WACA Ground (Western Australian Cricket Assoc), the pitch regarded as 'one of the quickest and bounciest in the world. As of February 2016 four of the nine fastest Test centuries have been scored here' but as host to international games it's 'all out' for the WACA.. fascinating stuff right :) Happy Tuesday, take care and stay safe.. P.s. to see similar above shot in b & w with a touch of colour have a peek here! It's all about superheroes these days. So many movies depicting the hero swooping in at the last moment to save the day.. or even the world! I confess it's not my favourite movie genre, I'm more of a foreign movie addict so you'll have to help me here. Starting from the top Captain America? Spider Man, that's a long-shot, the Hulk and maybe Thor? How did I do? Aimee would know in a 'Flash' :) This situation saving foursome found down a lane in Highgate. Happy Monday, take care and stay safe.. There was no time to get out and about with the camera yesterday.. thank heavens for the archives! A few shots here from WA Day a few weeks back. The parrot and black swan emblematic to WA is on the other side of the mural shown here. night and day they are always firemen.. Gregory Widen. Is there a rule in the fireman's handbook that apart from being brave and dedicated they must also be fit and good looking.. you might remember my last encounter with a fireman in the city, hot stuff! Much more seriously, seeing the horrific scenes of the fire in a residential tower in London yesterday highlights the ferocious danger men and women firefighters around the world put their lives in every day. In the words of Maya Angelou 'how important it is for us to recognize and celebrate our heroes and she-roes'! Happy Thursday, take care and stay safe.. They really are! I did try to walk past them.. they look delicate, fragile, not in the plan for my new robust, easy care Aussie weather garden, but I couldn't do it! The moment I imagined looking at them in the garden outside my window while writing the blog the struggle was over :) It's not often I get so excited about a new plant but just look at the variegated colour, even the leaves, above, are gorgeous. 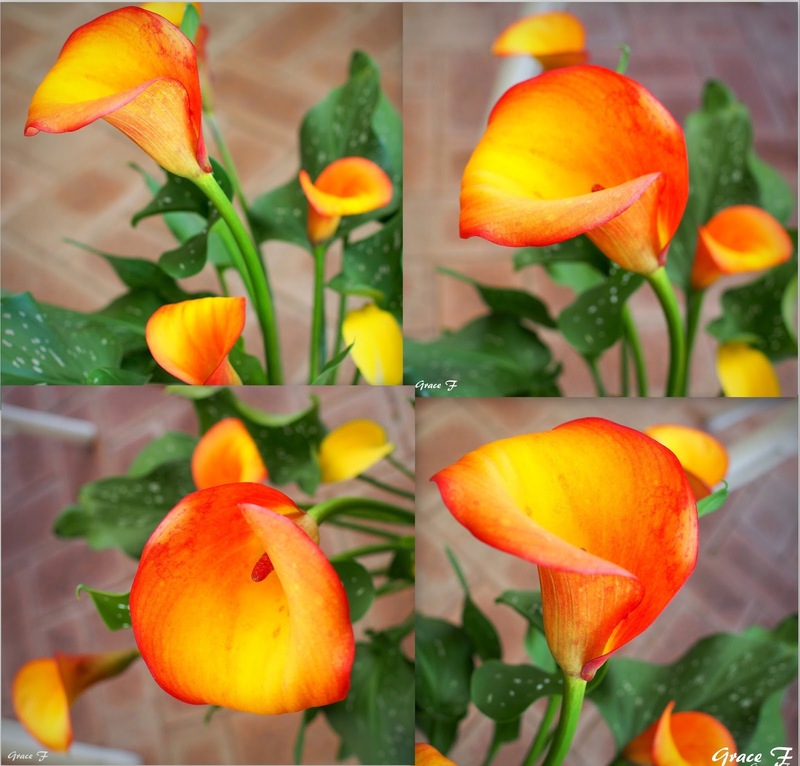 Looking at the care instructions for 'calla lilies' here I think I may have planted at the wrong time seeing as we're into winter now.. but it's all relative, it was 23C today, perhaps they will survive after all, will show you when they have multiplied into many.. positive thinking :) Happy Wednesday, take care and stay safe.. P.s. you might know them as California lilies! The Blue Flamingo.. 'good times and cold liquor.'. Spotted in the inner city suburb of Leederville adorning the walls of the tres cool Blue Flamingo a mural by Perth artist Paul Deej, remember 'Octogirl'.. incroyable talent! It's no wonder that Perth has made its way onto the list of top eight cities to find the best street art.. sssweet! Happy Tuesday, take care and stay safe..
Four men on a bench and one of them said.. The 'green lungs of the city'..
WA Day at Elizabeth Quay encore..
WA Day at Elizabeth Quay..
A little bit tired and a lot sad! Kings Park. Lazy, hazy days of ... winter! A paler shade of grey..
CDP Theme 'nature'.. flora et fauna.